The 2014-15 Utah Jazz NBA basketball schedule kicks off on Wednesday, October 29th, 2014 at home against the Houston Rockets. The Jazz hit the road the next day to take on the Dallas Mavericks before heading home to take on the LeBron James led Cleveland Cavaliers on Wednesday, November 5th, 2014. The Jazz enjoy a 5 day break over the Christmas Holidays before returning to play on December 27th, 2014 at home against the 76ers. Utah wraps up the 2014-15 NBA regular season on April 15th, 2015 on the road against the Houston Rockets. 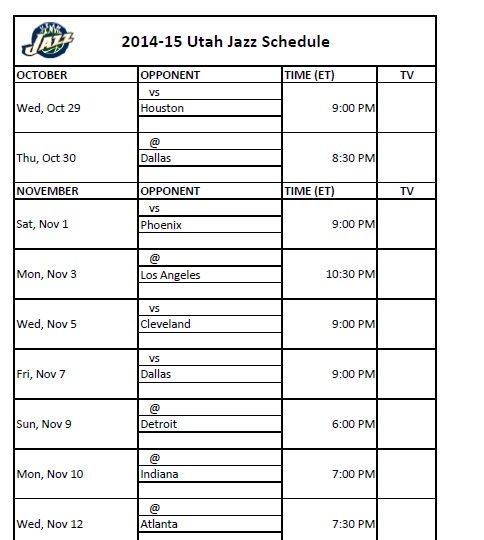 The following printable 2014-15 Utah Jazz Blazers schedule is provided for those who would like to print out the team’s schedule for the 2014-15 NBA regular basketball season.